The idea behind Day Trippers is a simple one. We can all remember the first ‘road trip’ we made to the continent. It is a step up from a Sunday morning ride, involving an early start, Eurotunnel or Ferry, a long list of do’s and don’ts, the ‘wrong’ side of the road, unfamiliar road signs and kilometre upon kilometre of empty French roads. While a lot of C&F members have many years of experience touring around the world, for many, a week-long trip to the South of France can seem like too big a leap from a morning cruising around the home counties. That is where Day Trippers comes in! We stick to a simple formula - 150 miles ‘abroad’, a lunch stop, afternoon coffee and back home to Blighty before dark. We try to experience a cross-section of roads, from motorways to country roads that don’t seem to really go anywhere in particular. A good spot for lunch is obligatory, as is a fuel stop half-way to accommodate those of us with more modest fuel ranges. The emphasis is on a relaxed day out. Some spirited riding, but never frantic or late for trains. However, bearing in mind the concept of ‘experiencing a touring holiday, but condensed into one day’, we must always bear in mind that events can have a habit of challenging the best laid of plans. And that is precisely what happened on this year’s event! 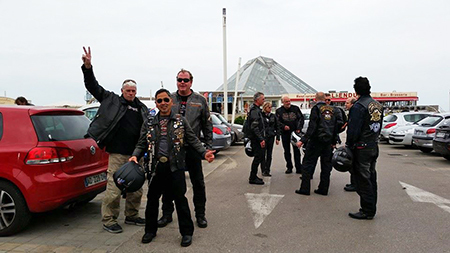 Most of the party of 19 were able to book the suggested crossing, and the others all listened to instructions to book an earlier train, and were waiting at the Total Service Station just outside the Eurotunnel Coquelles Terminal. Cogs Greenhow and Paul Rickman elected to cross on a Ferry, but then had their first adventure trying to negotiate their way back to the Services from the Calais docks (not easy, and involving dodging through a Lorry Park). So, challenge number one successfully completed. After the mandatory signing-on and briefing ceremony, we had a show of hands to establish how many ‘touring virgins’ had been brave enough to give this a go, and I was delighted to see that we had seven (full marks to Cogs Greenhow, Emine San, Haydn Burton, James Goldman, John Rudge, Paul Rickman and Peter Smith). With everyone fuelled-up and briefed, we set off along probably THE most scenic road in Northern France, which threads out of the infamous Sangatte, down to Boulogne-sur-Mer, where we briefly diverted onto the Autoroute to keep the ride together and away from traffic. As we approached our lunch destination, le Touquet Paris-Plage, the skies were very grey and we did get a few spots of rain. But, by the time we reached the seafront, the sun was trying very hard to break through the clouds, as we decamped to one of the many eating spots around the town. After a leisurely lunch, we strolled South out of town for the middle section of the ride, only to head into light drizzle that slowly developed into persistent rain, by the time we reached Berck. With a degree of resignation, I pulled up so that the group could ‘wet-up’. Motorcyclists, especially when it comes to adverse weather, tend towards the optimistic, and this was no exception. Yes, if the rain had persisted as it was, not donning waterproofs would have been just about okay. However, nothing could have prepared us for the weather that was a bit further up the road. It absolutely deluged! I think that I have only witnessed rain like that a handful of times in my life. And, only a couple of times during the hundreds of thousands of miles I have clocked up on two wheels. We were a couple of miles from our turn off into a town for the scheduled fuel stop when the rain changed its mood and became a full-on monsoon. The road completely disappeared, transformed into a river in seconds. I decided that it would be extremely dangerous to stop on the dual-carriageway, as there was traffic and zero visibility, and so slowed down behind an articulated lorry and trickled off at our exit. It was also extremely unwise to leave anyone on the slip road, and so, seeing many single headlights behind, I felt sure we were still ‘attached’ as a group. Unfortunately, only half the ride made that turn, and the remainder ended up in three pieces. Oh dear! That is my primary job, keeping the ride together and getting us from A-to-B without drama. Yes, lessons can be learnt, even for an experienced Road Captain. But, back to the ride. Paul Garrett had not opted for wets when we stopped, and cried ‘enough’ on the dual-carriageway, pulling up for a complete change of clothes - quite what other road users made of the sight of a motorcyclist stripped down to his unmentionables, under a tree, in the middle of nowhere, is anyone’s guess. “Last Lady”, Sarah Papas, pulled up and was despatched by Paul almost immediately, such was his determination to get out of his clothes - which was a novel experience for Sarah! I should add that, only slightly more sensibly than Paul, I had also opted for only a waterproof top, and so remain full of sympathy for his actions - my lower half would have been drier had I just stepped out of a waist-deep pond! By this point, we now had half the ride in a Supermarket Petrol station, Paul Garrett under a tree in his pants, Sarah trying to see through spectacles, a visor and a screen and the rest of the pack merrily splashing their way along the dual-carriageway towards Arras. Oops! Vainly hoping and wishing that the Last Lady would appear any minute, having swept up the remaining ride, or that someone would have checked the supplied maps and worked their way back to Hesdin, it became obvious that we were in for a long wait. So, the remaining group still in my charge (none of whom actually needed any fuel, ironically), headed back out as soon as the rain reduced to a more normal ‘heavy’ level. The ‘other’ group had continued along the road to Arras, and after crossing a couple of roundabouts and not seeing any drop-offs, decided that something must have gone wrong. Also, by this time, the two Sportsters in this group were now running on pure hope, which my also have been a clue, as I had assured their riders that we would be stopping (20 miles further back, as we have by now learnt). Luckily, a couple of the group were armed with Sat Navs, and so determined to plot a ‘scenic’ route back to Saint Omer, to, hopefully, rendezvous with the rest of the ride. By all accounts, this worked out pretty well. Time was against them, Saint Omer proving a tad too far out of the way, and so the intrepid group carried on back to Coquelles, just missing their scheduled return. Well done, and a big thank you to Andrew Eborn and Cogs Greenhow, for stepping up and getting the group back to Blighty. The Last Lady, Sarah, arrived about five minutes after us. All we could do now was hope everyone else was having a good time. And, by all accounts, they certainly were - it was with great relief that I received several messages later that evening telling me how much fun everyone had. Funny how adversity has a habit of doing this. 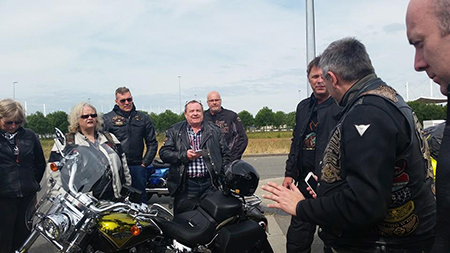 We finally caught up with Paul “Full Monty” Garrett at the Eurotunnel Terminal, who also reported to have had a brilliant afternoon riding back. So, one-way-or-another, despite the best efforts of the weather and the Road Captain ‘in charge’, everyone had a brilliant Day Trip. So, What Did We Learn About Riding Overseas? > Don’t trust a Road Captain! Photographs courtesy of Emine San.